Stein Slette of the Hope College kinesiology faculty has been presented the 50th “Hope Outstanding Professor Educator” (H.O.P.E.) Award by the graduating Class of 2014. The H.O.P.E. award, first given in 1965, is presented by the graduating class to the professor who they feel epitomizes the best qualities of the Hope College educator. 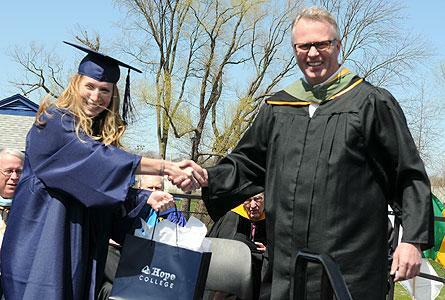 Slette was named the recipient during the college’s Commencement ceremony, held at the Ray and Sue Smith Stadium on Sunday, May 4. Slette is an assistant professor of kinesiology. His current service on the faculty began in 2008, but he also taught at the college during the latter 1980s and mid 1990s. He teaches a variety of courses in the Department of Kinesiology. During the 2013-14 school year, for example, the mix included the introductory “Health Dynamics” course; the upper-level “Anatomical Kinesiology” and “Mechanical Analysis of Human Movement” courses and “Exercise Physiology” laboratory; and activity courses in jogging, and cross country skiing and orienteering. He was a visiting instructor at Hope from 1988 to 1990, and was also an assistant professor at the college from 1993 to 1997. He was the founding coach of the women’s soccer team, leading the team during its debut season in 1989, and also coached the team from 1993 through 1996. In addition, during the 1988-89 school year he and his wife, Jane, who is a 1981 Hope graduate, served as resident directors in a Hope residence hall. A native of Oslo, Norway, Slette came to the U.S. in 1982. He graduated from Hope in 1987 with a major in physical education and a social studies composite minor, and as a graduating senior received the college’s William and Mabel Vanderbilt Family Award for scholarship, integrity and the promise of continued outstanding service to others. He completed his Master of Science degree in exercise science at the University of Utah in Salt Lake City in 1992. He was on the faculty at Whitworth College in Spokane, Washington, also coaching women’s soccer, during the 1992-93 school year. Following his 1993-97 service and prior to returning to Hope in 2008, he worked in wellness in the private sector in the Holland area, teaching and leading fitness, training and outdoor activities for a wide range of participants, from kindergarten-age through adult. Slette and Jane have two children: Ingrid, who graduated from Hope in 2012; and Andreas, a Hope sophomore. His parents-in-law are Robert N. DeYoung, who retired from the Hope staff in 2000 as vice president for college advancement, and the late Marcia DeYoung, members of the Classes of 1956 and 1955 respectively. In the fall of 2010, Dr. Sonja Trent-Brown of the Hope College psychology faculty was the first professor to address the members of the newly arrived Class of 2014 as they prepared to begin their college years. The sermon at the Baccalaureate service for the Class of 2014 on Sunday, May 4 was delivered by the Rev. Dr. Gregg Mast, President, New Brunswick Theological Seminary. His sermon was titled “For God so loved the world…” The lesson from Scripture was John 3:16.